As I mentioned earlier, I've received a lot of comments and questions about my eating habits since dropping most animal products from my diet. 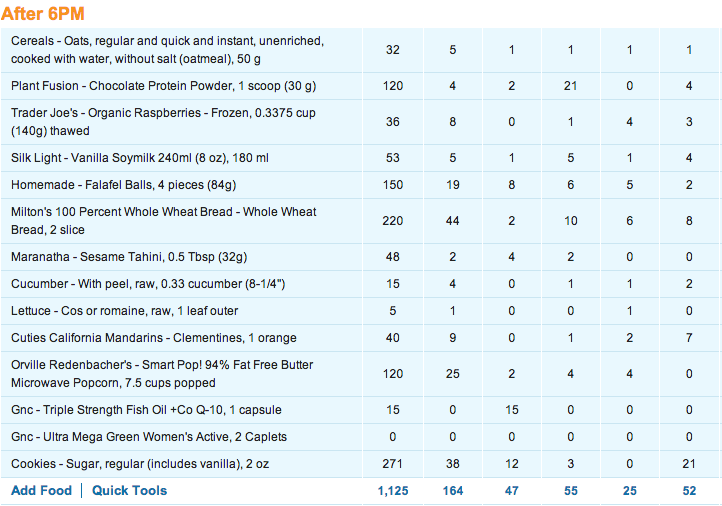 To give you a sense of what I eat to maintain my health, I decided to track my intake and record it here. These days are not consecutive, but are over the course of a week or two. Since we eat a lot of homemade foods, and tracking recipes is really time consuming, I definitely made some approximations. This is pretty close, though, to what I ate. 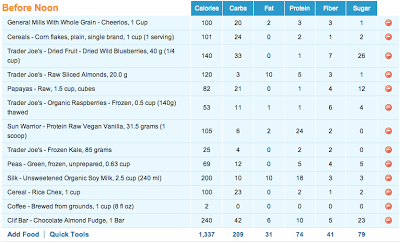 You will notice that I regularly consume over 120g of protein, plenty of fiber, and a good balance of macronutrients. You will also notice that I eat a lot of sugar. Yum. 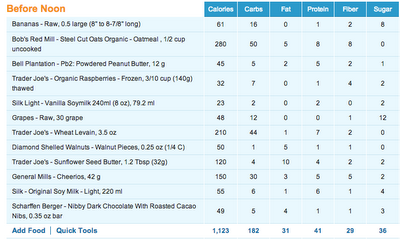 Note: I am currently on a 500-calorie deficit to try to slowly drop down to racing weight by mid-January. The calorie budget reflects this, and is 500 calories less than I theoretically burn in a day. Also note: I'm not a nutritionist, and I'm probably making mistakes. This is not necessarily the right or the best thing for you to eat. I'm trying it out, and it's what I think works best for me right now. 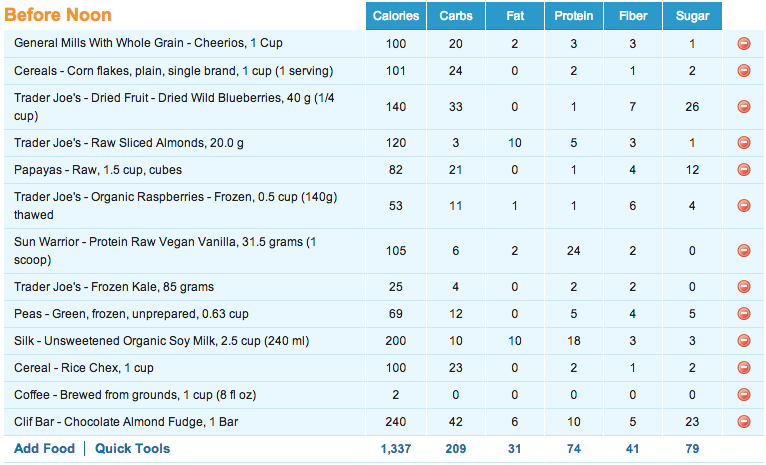 I am working on decreasing my sugar intake some and replace it with more complex carbohydrates and fats. 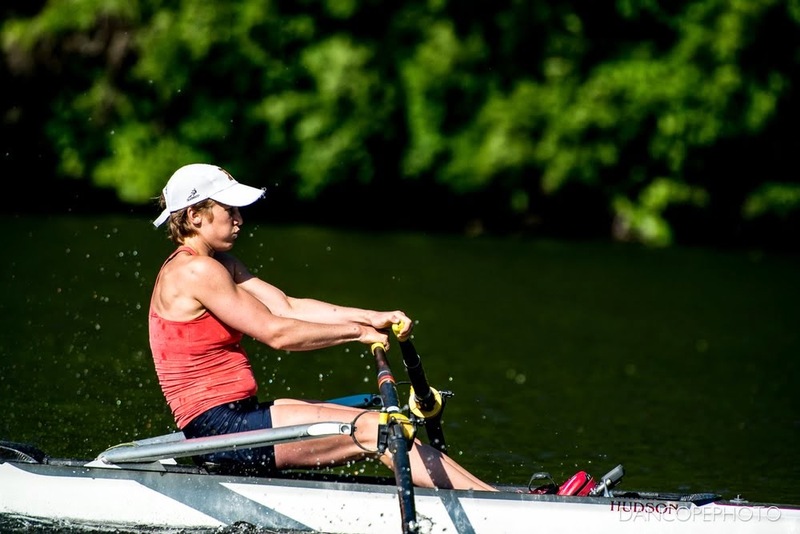 My diet used to be incredibly high in both fat and sugar; I'm doing better with both, although I think I dropped a bit too much fat from my diet--I've read that at a certain point you begin to increase your risk for injury. 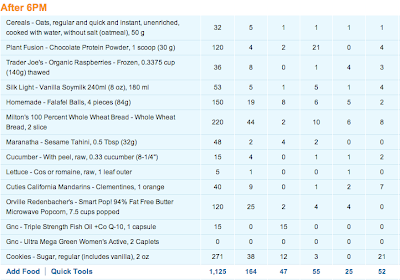 You may also notice that I'm using a lot of protein supplements--protein powder, vegan sausage, etc. 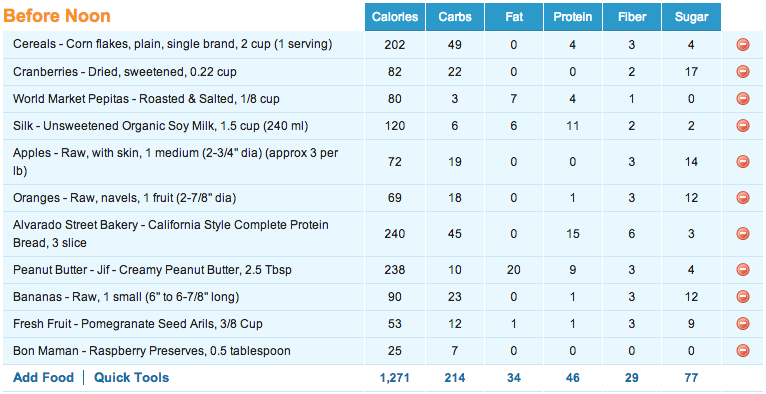 Partly, this is because of the decreased calorie load. 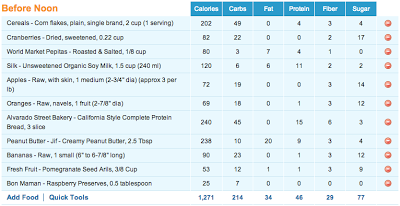 Getting 120g of natural, vegan protein is a cinch when you're eating 3500+ calories a day; it's much harder when you take away 500 calories; I eat about 15% protein, so 500 calories takes away about 18g of protein. One scoop of protein powder or one veggie dog eliminates that deficit easily. 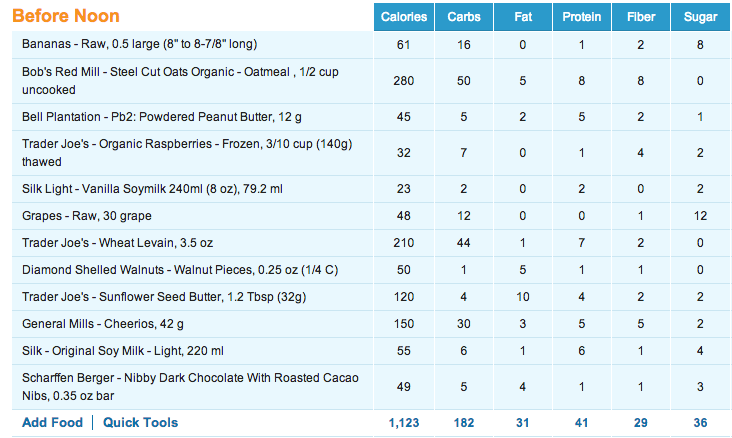 I'm also fairly certain that the program I use (MyFitnessPal) underestimates the number of calories I burn in a day. When I track my food, I definitely miss some stuff, and I still lose weight at least as fast as they expect, usually faster.